Too much rain! There has been a downpour around Baltimore this morning and the results of the record monthly rain are seen all around. Some area roads are still impacted and on the Susquehanna River the flood gates continue to open. 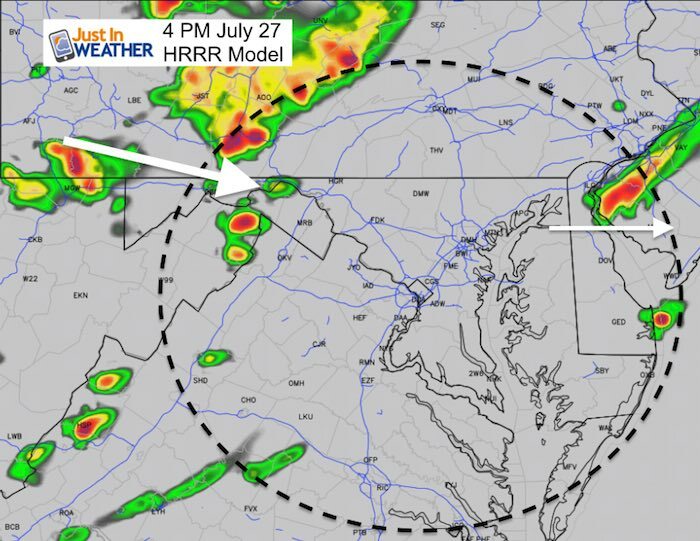 This places Port Deposit and Have de Grace in the likely flood zone. 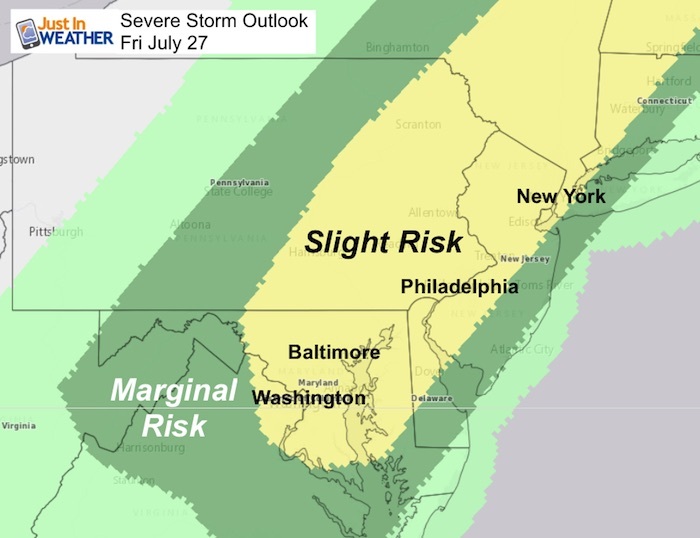 Now we set our sights on the risk for severe storms this afternoon and evening. Heavy rain will lead to more flooding, plus the potential for damaging winds to topple trees in soggy soil. We also have the watch for large hail and an isolated tornado. We have a full moon which may make the kids with cabin fever extra wild today, but the longer lunar eclipse of the century is NOT going to be seen here. Besides the clouds and rain, the timing does not line up for us. 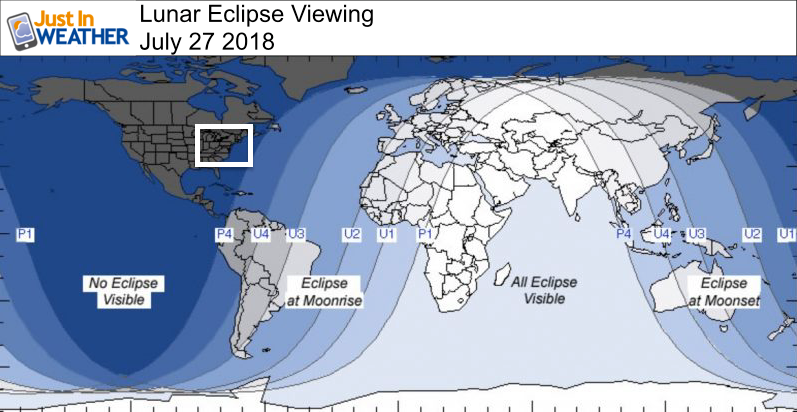 The eclipse is for the other side of the planet. We already have the muggy 70s and highs will reach the mid to upper 80s today. Heat Index values into the 90s as it will remain humid. 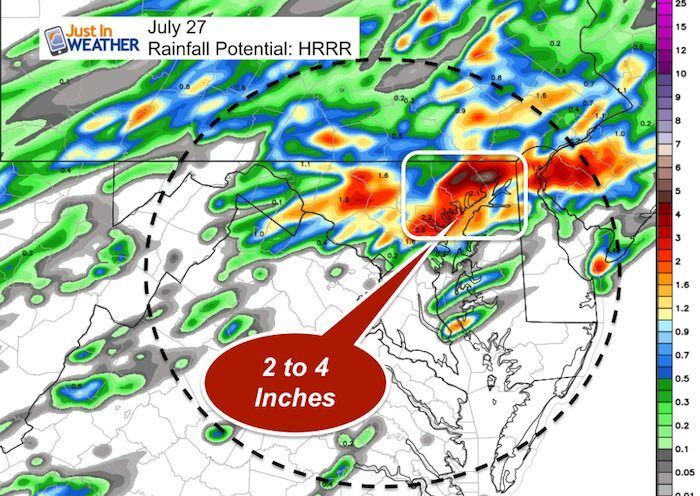 The highlighted area shows northeastern Maryland Harford and Cecil Counties) with the greatest rainfall. This is due to a cluster of rain that may form ahead of the main storm line and possibly slow down the line. The timing wil be between 6 PM and Midnight. Most of our region will be dry Saturday and Sunday, but showers will linger at the beaches and southern Maryland. Monday begins another long stretch of rainy days.